It would simply not be right to let Halloween pass unmarked and just as my grandfather once terrified me with an entirely fictional tale of Lord Byron's ghost, so too did he like to tell a scary tale come 31st October. I considered crime, mused or monsters and finally settled on spirits and so it is my pleasure to share with you the strange tale of Nan Tuck's ghost. As the 18th century turned into the 19th, Nan Tuck lived in obscurity in Buxted, Sussex and was, to all intents and purposes, not a person who seemed destined to stand out. With her husband she went about her quiet business in a cottage on the edge of the woods and life rolled past with the years until, quite out of nowhere, Mr Tuck dropped down dead. Legend tells us that Mrs Tuck was responsible for her husband's death and had fed him a most deadly poison though whether this was true or not, it mattered little to the local populace. With the death of Mr Tuck husband the locals began to chatter. Wasn't Nan a little unusual? A little old, ugly and eccentric? Could she possibly be... a witch? Of course, it was not long before villagers pointed the finger at the widow and she fled her home, not much fancying a run in with the law on charges of witchcraft or murder. With her pursuers hot on her trail, Nan decided that the only sure place of refuge was in the dark woods that surrounded her home in Buxted. Perhaps, once the search party had passed, she might continue her escape or even make a run for the sanctuary of the church but if she were to be caught, the scaffold surely awaited the fugitive. In fact, the pursuing officials caught sight of the escaping woman and took off after her, her capture inevitable now. Crashing through the trees and into the woods they found... nothing. Nan Tuck had vanished clean off the face of the earth and left behind no trace, never to be seen again. All that marked the spot of her disappearance was a patch of utterly dead foliage and even now, it is said that nothing grows on the spot. Indeed, Mrs Tuck still puts in the occasional appearance, terrifying unsuspecting wanderers in the woods and on the lane that now bears her name. 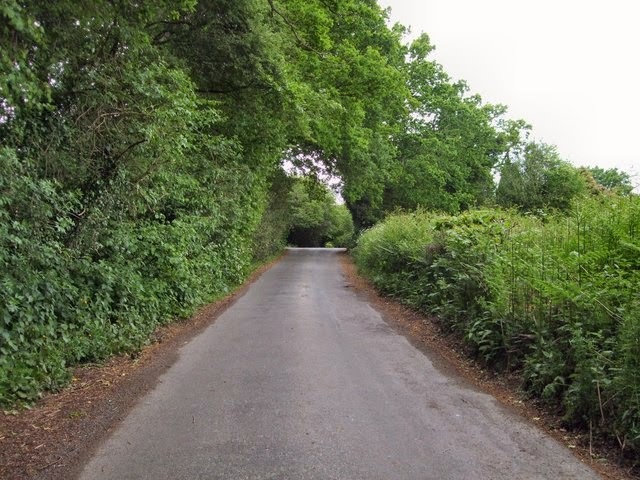 Truth be told, there are half a dozen legends attached to the place known as Nan Tuck's Lane in Buxted. Was Nan an elderly lady or a young maid, did her unfortunately fate befall her in the 18th century or the very early 19th and did she disappear of her own, was she hanged or did she fall victim to a miscreant? We can never know for sure, but I hope my tale today whetted your appetite for a most ghostly Halloween! Those of you who visit the salon regularly or have seen me elsewhere on the web chatting about my influences, know that I owe my love of history and tall tales to my old granddad. A born storyteller, he liked the occasional tipple and one of his favourites was a tot of rum or, as he would term it, "grog". 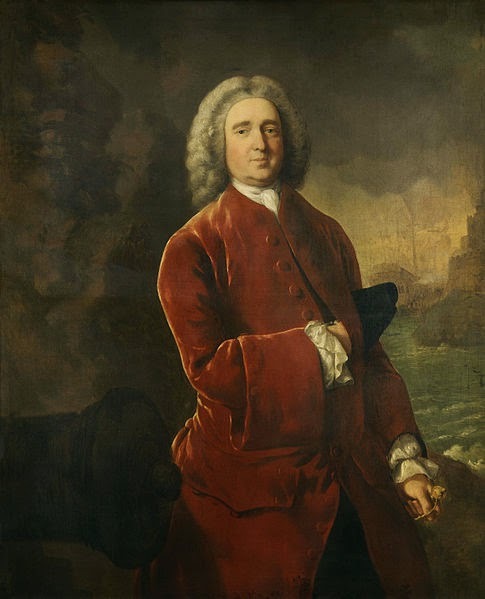 Today we mark the death of Admiral Edward Vernon, a career officer in the British Navy from the age of just sixteen. 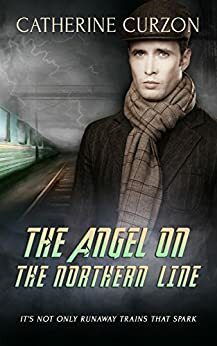 As his career progressed, Vernon earned the nickname, Old Grog, for his love of coats made of grogram cloth; however, the word has since come to mean something in no way related to clothing! As an officer in the Navy, Old Grog faced the same challenge as many of his fellows, that of the men under his command getting a little carried away on their daily rum ration. Concerned about the affect of this libation on both their physical health and their moral wellbeing, in 1740 Vernon decreed that the rum ration should henceforth be diluted by water. The sailors were understandably not at all happy, since water on board a long sea voyage was far from palatable. In answer, Vernon replied that they could purchase limes or sugar with thick to sweeten the drink and, quite without realising it, those who added this extra ingredient were doing wonders for their health. Almost ten years later, in 1747, James Lind concluded that citrus fruit was a valuable weapon against scurvy and the Royal Navy swiftly leaped into action. Suddenly, instead of being an optional extra, all naval rum rations were supplemented with lime or lemon juice, the newly-created drink being nicknamed, Grog, after the man who inadvertently created it. Thomas Carlyle compared her large cheeks to a “Westphalian ham” but, sadly, this painting doesn't appear to do them justice! Today we find ourselves back in Russia to share the final days of another famed and, in this case, feared Empress. 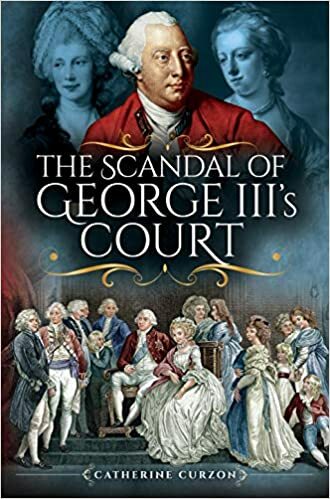 Just as we peeked in at the death of Catherine the Great, now we are afforded a glimpse into the death of Anna of Russia, an autocratic and strong-minded ruler. 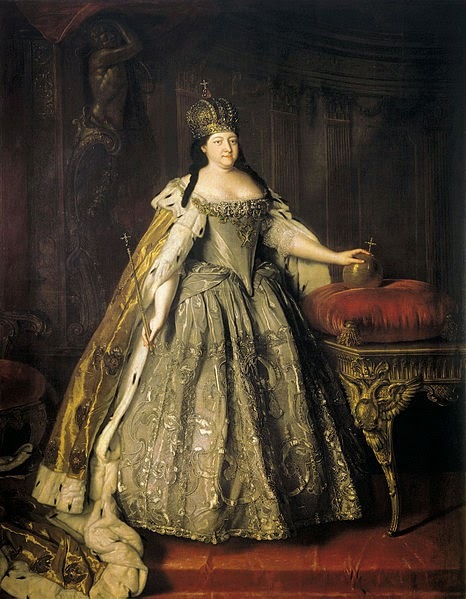 After an iron-gripped decade as the Empress and Autocrat of all the Russias, it was becoming increasingly clear to Anna that her health was in somewhat speedy decline. 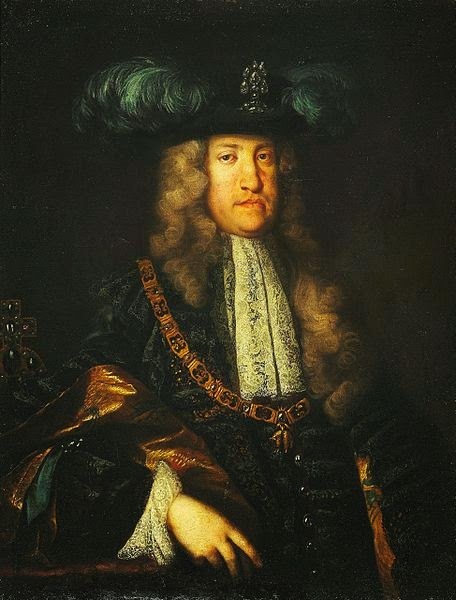 With one eye on the future she appointed Regent from her circle of favourites and selected her infant grandnephew as a successor, determined that the descendants of Peter the Great would never again sit on the Russian throne. For many years Anna had suffered from debilitating gout and as the years passed, so too did the symptoms of her ailment grow worse and worse until her mobility began to suffer. Not only this, but she was beset by initially unexplained pains in her torso that were later diagnosed as an ulcer on one kidney and this was the start of the kidney trouble that would eventually kill her. 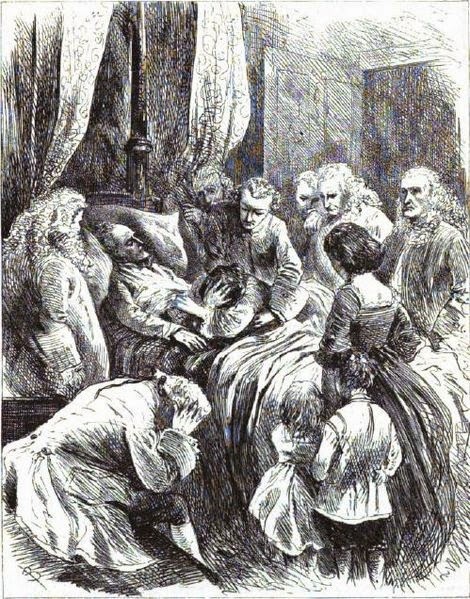 As 1740 wore on, the pain grew more pronounced as Anna was beset with kidney stones and she was forced to retire to her bed. Here she remained in increasing pain until she died as a result of kidney failure at the age of 47, leaving her carefully-laid plans for the succession to fall into failure. I have made a few theatre trips of late and have several more planned in the forthcoming months, much to my delight; from comedy to drama to musical, it will be almost theatrical winter in the salon! Although I do not have any operas currently in my theatrical schedule, it is that art form that concerns us today as we find ourselves in Milan for the premiere of Vincenzo Bellini's 1827 smash hit, Il pirata. Based on Charles Nodier's play, Bertram, ou le Pirate, itself adapted from an earlier work, the opera tells a tale of love, death and madness and is regarded as a romantic tragedy of epic proportions. Bellini was just twenty six years of age when he arrived in Milan and began to mix in theatrical and musical society, forming close bonds that saw him in the inner circle of those who called La Scala their workplace. It was through these circles that he met librettist, Felice Romani, who discussed with the young composer the possibility of collaborating on an operatic adaptation of Nodier's play. It was to be the start of a hugely successful partnership that extended over numerous projects and years, with the two men forming a close working relationship that resulted in some of the most celebrated works of the era. 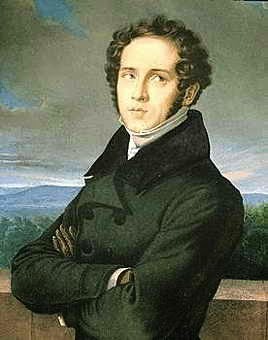 With the project officially starting in May 1827, things moved fast and by summer, not only was Bellini was well-embarked on the music, but much of the casting was already confirmed with everything on track for an October opening at La Scala. Although the process moved fast and actors and creatives found the rehearsal process fraught, their efforts were not in vain and the opera was soon on the lips of Milanese theatregoers, with tickets for the opening night in high demand. In fact, as the curtain came down to rapturous applause on the opening night, there was no doubt whatsoever that Bellini and Romani had a hit on their hands. Almost immediately Il pirate became the hottest ticket in Milan and for the duration of its time in the repertoire, which ended on 2nd December, was a complete sell out. 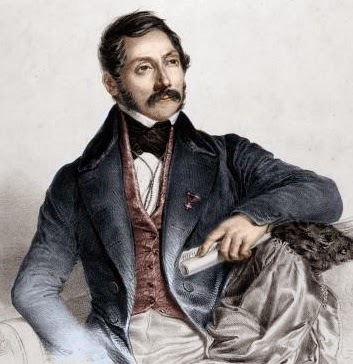 The cast and creative teams rode the wave of success as the opera transferred across Italy to enormous success and acclaim in the following year, receiving its first international performances too. By the time Il pirate sailed into London in 1830 and America two years later, it was a phenomenon and remains in performance to this very day. On this day in 1764, one of the most iconic painters in the history of English art, William Hogarth, died. Beloved of court and public, Hogarth turned his hand to portraiture, caricature and satirical prints. His subjects ranged from the street vendor to his own beloved pug and, as we shall see today, the most noteworthy names in Georgian society. Miss Mary Edwards of Kensington was a most singular sort. One of Hogarth's favourite portraits, the eccentric heiress inherited a fortune in her early twenties and she and the artist enjoyed a fruitful, close friendship as she brought commissions and inspiration to his door including a portrait of her own infant son and caricatures of society types who had once mocked her somewhat unorthodox approach to life. When the time came to paint Mary herself in 1742, she was thirty seven years of age and had lived an eventful life, including marrying and then casting aside a most avaricious and scheming husband, Lord Anne Hamilton, whom she believed intended to relieve her of her fortune. In this oil painting Hogarth captured his adored patron perfectly, his brush picking out a kindly, playful and undeniably appealing face, the central figure of Mary in her vibrant red dress shining out against a formal dark background. Remember, Englishmen, the Laws and the Rights. From age to age by your renown’ed Forefathers. . .
Do thou, great Liberty, inspire their Souls! This portrait is not simply that of one more sitter in the appointment book, it is a friend captured forever on canvas, Hogarth's brush showing us how highly he thought of this most illustrious lady. 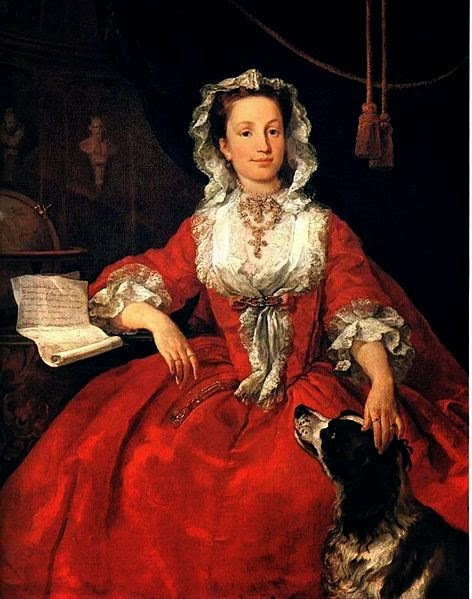 One year after Hogarth completed this lovely painting the lady was dead yet she lives on even now, vibrant, happy and adored, in this remarkable painting. 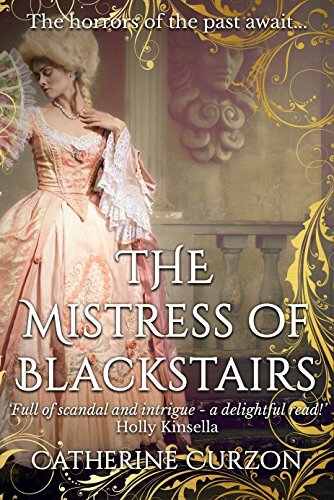 I have, of late, been perusing some books and papers dealing with the wonderful clothing of the long 18th century as I work on edits of Mistress of Blackstairs. Although Moineau is a most well-dressed lady and certainly enjoys the best of everything, the gentlemen of her acquaintance are slightly more prosaic. Certainly, I cannot see any of them wearing the most remarkable shoe shown below! 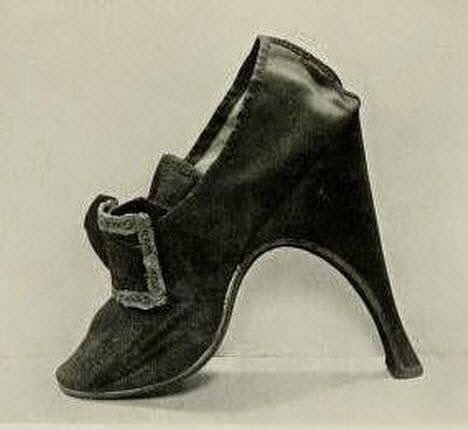 I discovered this shoe within the pages of a 1904 book entitled Royal and Historic Gloves and Shoes. Written and illustrated by William Beales Redfern, the book was published in 1904 by Methuen & Co and is a catalogue of photographs of royal shoes and gloves through the ages, each black and white photograph accompanied by a short paragraph of explanatory text, as seen below. This gentleman's leather shoe with its ornate silver buckle is, of course, notable for its six inch height height. Sadly we cannot know who it was intended for, nor whether it ever graced royal feet. A salon visitor has posited that perhaps the show was intended to correct or disguise a physical impairment or perhaps even a limping gait but I think a shoe of this height would be more likely to cause such an issue. It is a shame we will never know the story behind this remarkable footwear but then, perhaps there is a tale just waiting to be told and this shoe is a part of it! James Gillray is, as regular visitors to the salon well know, something of a hero of mine. In his work one is transported back into the Georgian era but not the fine world conjured by the great portraitists and landscape artists, rather a somewhat more bawdy, earthy version of the long 18th century. In Gillray's works one can hear the bustle of the streets, see the people who hid beneath the wigs and panniers and smell the odours of the great Georgian city of London. 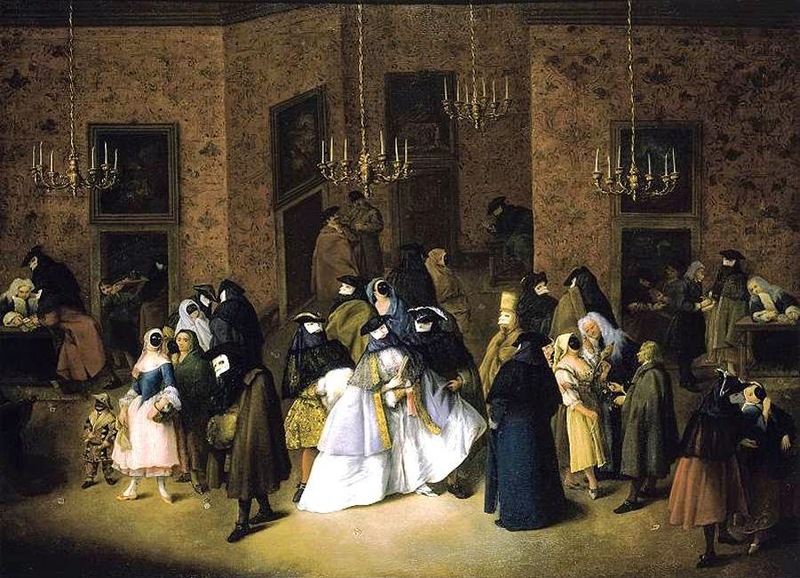 The work that has caught my eye today is The Whore's Last Shift, a work completed in February 1779. It is, to my mind, one of Gillray's finest pieces and presents a starkly honest look at the life of one of those infamous Covent Garden ladies so associated with the pleasure houses of the long 18th century. From the neck up the lady conjures up nothing but fashion. She wears her hair in an elaborate style, adorned with decoration and plumage that would no doubt make this particular lady most eye-catching as she promenades. The rest of the picture tells a somewhat different story, one that is borne out by the title and sad circumstances of the lady at the centre of the etching. The woman is washing her last shift in a cracked chamber pot, itself balanced somewhat precariously on a broken chair. Naked save for her badly-holed stockings and garters she concentrates on her lonely task in a room that does not speak of success and extravagance, but of poverty and misery. Her bright frock and hat are cast aside though in considerably better condition than the rumpled bed or peeling plaster on the walls. A furious cat howls on the window ledge, a far cry from Hogath's faithful pug, and she has decorated her room with a broadside ballad ironically titled, "The comforts of Single Life. An Old Song". Gillray does not seek to make a judgement about the woman's place in the world nor her circumstances, but instead presents the scene and invites the viewer to make their own conclusions. 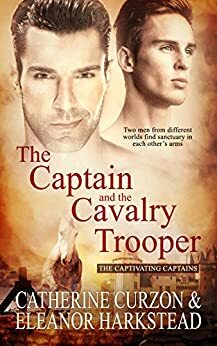 There is no moral conclusion here but instead a hundred different stories and scenes. 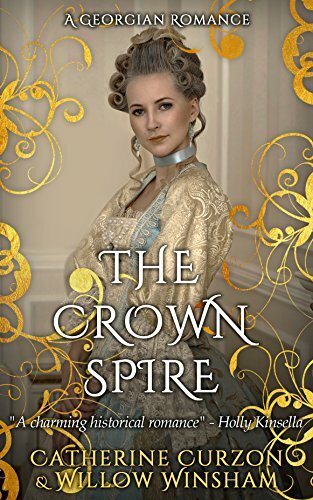 The one thing we can be sure of is that, once she is swathed in her gown, fashionable hair towering over her, this unfortunate lady would cut a far finer figure. Gillray has afforded us a glimpse beneath the petticoats of this particular lady, and it is a sorry story indeed. My tale today is another of medicine, brought to my door by Doctor Dillingham, who has recently returned from a sojourn to the continent. It is, however, also a story of family and of lives that ended before their time. When I first encountered a mention of the twins known simply as Helen and Judith, the story struck me as one that I wanted to share and off I went to find out more. I am pleased to present the tale here on the anniversary of their birth. On the face of it, there should have been little of note to remark on in the birth of Helen and Judith, twin girls born in Szőny, Hungary. Although their surname is lost to history, they became knows simply as the Hungarian Sisters, and that nickname lasts to this day. There was indeed something most remarkable about the sisters though, as far from being just another set of twins, they were conjoined twins. Medical science was baffled by the birth and swiftly decided that their circumstances should be blamed on their mother's overactive and somewhat excitable imagination during the pregnancy. This is quite a diagnosis, of course, but there the matter rested without further debate. Helen was the first child to be born and within three hours Judith also emerged, joined to her sister at the coccyx. Just as she had been born first, so too was Helen reportedly the physically stronger of the two, as well as the more attractive and intelligent. Luckily the sisters were able to adapt to their very particular circumstances and soon their unusual condition became their livelihood. From infancy into childhood, Helen and Judith were exhibited to excited crowds across Europe where they submitted to medical tests, enjoyed an education and enjoyed the society of artists, poets and others who found them utterly fascinating. 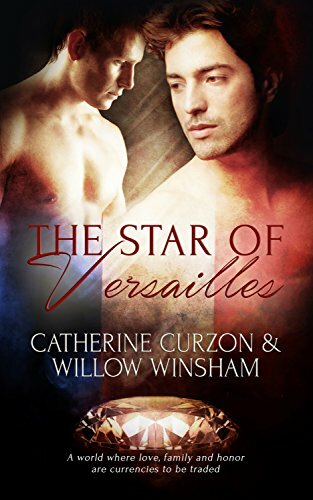 However, this life was not to last and Judith suffered a debilitating stroke at the age of six that left her partially paralysed for the rest of her days. For three more years the girls continued to tour Europe until, at the age of nine, Judith's physical state could no longer endure such rigours. The girls were taken into the Convent of St. Ursula in Presburg, Hungary and here they remained, focusing on their faith. The unusual story of the Hungarian Sisters was to end in 1723 when first Judith and then Helen fell ill with a fever. Throughout their entire lives, despite being conjoined, the girls did not share a sensation; they would experience neither feast nor hunger at the same time and lived as separate lives as they could yet, when their final moments came, they were almost simultaneous. Judith died early on 8th February and was followed within moments by her sister. The girls were laid to rest in the churchyard of the convent, the unusual lives of the Hungarian Sisters finally at an end. We have, of late, spent some time admiring the footwear and fashions of ladies of the 18th century. Today we stay on the topic of clothes but visit good old Prinny, never a man who was shy about dressing to impress. I do love a good Georgian uniform and this fits the bill perfectly, as I turn my eye to the Prince Regent's splendid jacket that he wore as Colonel of the 10th Light Dragoons. George became Colonel Commandant of the Dragoons in 1782 and by 1796 was Colonel. Although he adored the trappings of the military life, the prince was forbidden from undertaking active service by his father, George III. Disappointed but nothing less than obedient on this occasion at least, George combined his twin loves of spending money and the military into amassing a rich collection of military dress and other related objects. This rather splendid jacket is one of those items and came into George's possession in 1800. 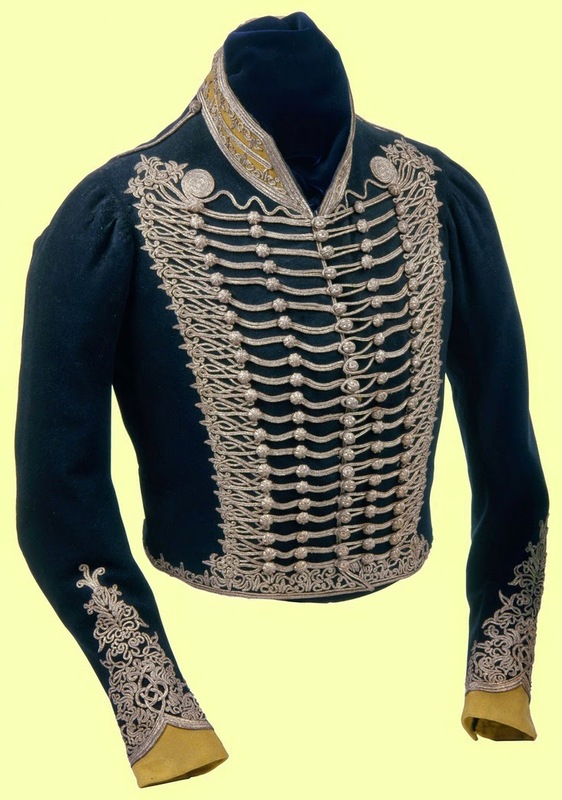 Made by JC Franck, a London tailor, the jacket is fashioned from a rich and suitable commanding dark blue. Its lining is white silk and the garment is adorned with bright silver lace and an eye-catching yellow detail that picks out the cuffs and collar. Happily this jacket remains in excellent condition and once can quite imagine why George loved it; it is a timeless garment, of its era yet as eye-catching now as it was two centuries ago. I am sure that Prinny cut quite a dash sporting about town in his brand new jacket! On this day in 1793, Marie Antoinette went to her death. Last year I wrote of the last day in the life of this most iconic of French queens but today, I thought I would mark the occasion with a somewhat more pastoral post. 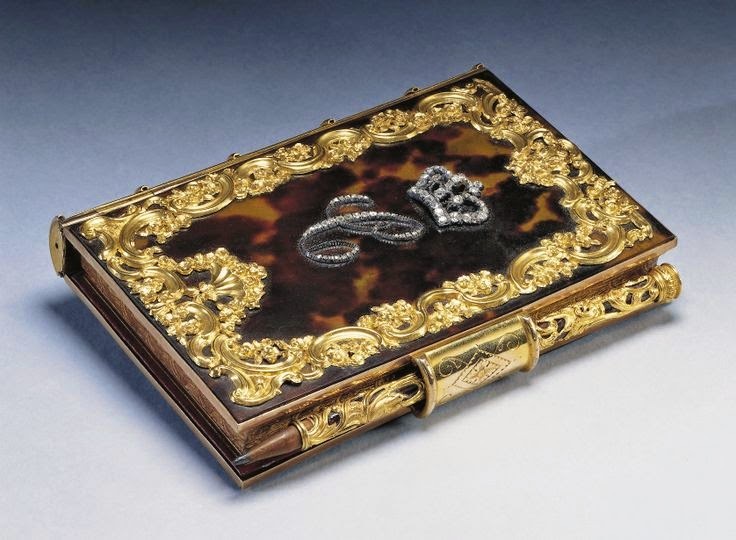 Indeed, the topic of my blog today is nothing more lofty than Marie Antoinette's shoes! 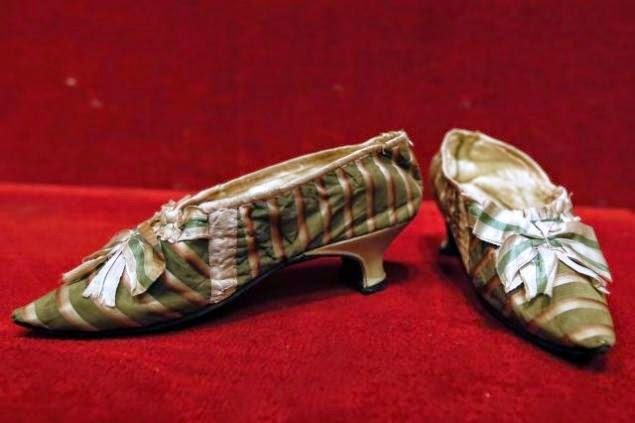 Having trod the floors of Versailles and no doubt accompanied some quite wonderful gowns, these delicate silk shoes in a suitably dainty green and pink hue saw the light of day once more on 16th October 2012, at the Paris Drouot auction house. Unsurprisingly, the shoes generated enormous interest and the auctioneer put an expected price on them of around €10,000 ($12,600 or £7,800). As is so often the case, this proved wildly inaccurate and instead the heeled footwear sold for a whopping €50,000 ($63,300 or £39,300) to an unidentified bidder. The shoes had been given as a gift to a servant, Alexandre-Bernard Ju-Des-Retz in 1775. He passed them along to his family and they continued to be handed down the line until they were eventually put on sale, along with a certificate of authenticity guaranteeing that the ill-fated queen had indeed sported these dainty little shoes during her tumultuous life! If only these slippers could talk, who knows what a tale they might tell! 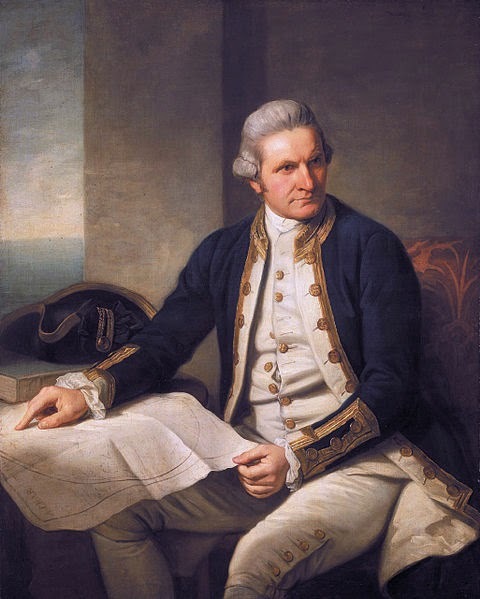 On the three occasions that I have told tales of Captain James Cook, I have featured the same 1776 portrait of the famed explorer. 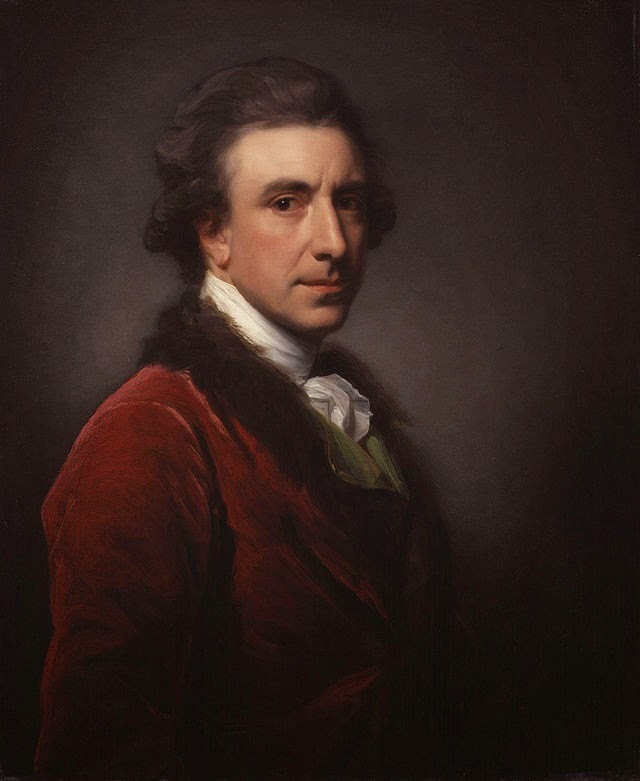 That portrait was painted by Sir Nathaniel Dance-Holland and, since today marks the anniversary of the artist's death, I thought the time was right to offer a little insight into iconic portrait of Cook. Of course, all of us Georgians know the Captain by reputation and there's many a seafaring gent pays his bar bill with stories of adventures alongside the Captain, half of them as fanciful as they false! Still, if today's post piques an interest in his voyages, you can also join him on Possession Island, Botany Bay and learn more of his grisly murder elsewhere on the Guide. In this rather fine portrait, Cook is certainly in his Sunday best and sports full dress uniform, as well as a suitable grave expression. As befits a gentleman given to exploration and charting the furthest oceans, the items depicted with the Captain are suitably iconic and chosen with great care. On the table what could be any chart is actually Cook's own chart of the Southern Ocean. With his finger he gestures to the east coast of Australia which, of course, he chartered. This hand is notable for what it doesn't show too, as Dance-Holland has elected not to paint Cook's right hand with a scar left by a burn some twelve years earlier. The portrait was commissioned by Sir Joseph Banks, who had sailed with Cook in the past, and the captain sat for Dance-Holland portrait on 25th May 1776 so that he might begin work. Whether Cook sat for the artist again we do not know but what is certain is that, upon its completion, the portrait was hung over the fireplace in Banks's home in London. 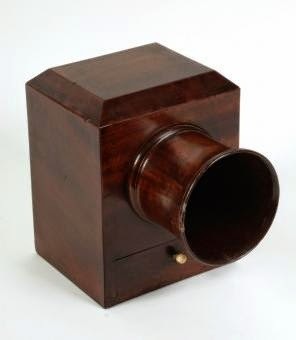 Here it remained until Banks died in 1820 when it went first to Greenwich Hospital and then on to the National Maritime Museum, where it remains to this day. 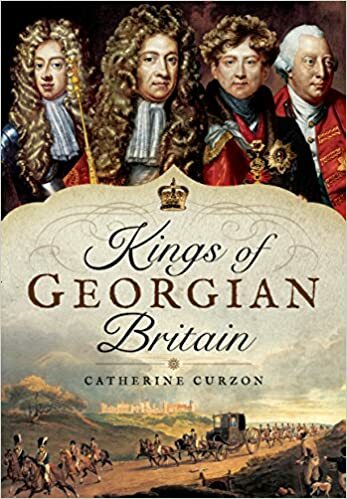 My post on the coronation of George IV is consistently one of the most popular here on the Guide. It seems that people never tire of reading about Prinny's largess and really, who can blame them? Several people have contacted me to seek more information about the photograph of the dress featured in that post and it is my pleasure to make that gown the star of its own tale, which I hope will entertain! 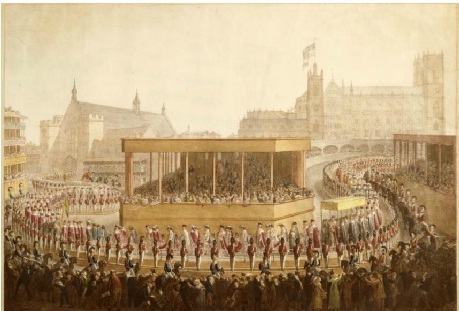 The coronation took place on 19th July 1821 and was a monumental undertaking. A cast of hundreds played their part and the start of festivities was a procession to Westminster Abbey, at the head of which walked Miss Fellowes, the King's herbwoman. 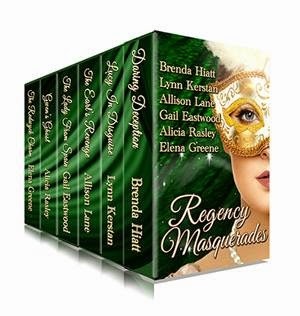 Behind her followed six attendants, all of her selection and all of whom were around seventeen years old. The six lucky young ladies were Miss Walker, Collier, Hill, Garth, Ramsbottom and Daniel and they walked two by two, each carrying their own basket of flowers. They scattered these as they walked, in a traditional ceremony intended to ward off plague and pestilence. The girls wore these gowns, made of cream silk gauze. Each also had an ornate ruffled collar, though these have since been lost. The hem and sash that decorate the gown might appear to be flowers but these are actually made of silk and cotton too, adding a very pretty adornment to the gown. 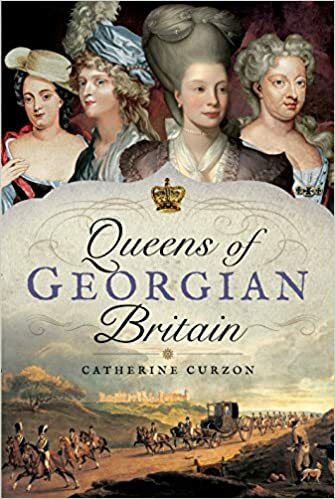 The procession must have been quite a sight to behold and one can only imagine the excitement of the young gentlewomen who were chosen to lead it; I am sure it was an experience they remembered all their days! 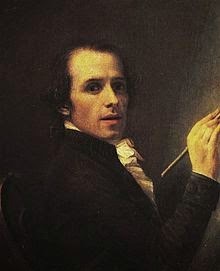 Leaving Rome in 1802, Canova was summoned to Paris by Napoleon himself who, keen to commission a statue from the famed artist, sat for a study and bust. After discussion with his patron as to the eventual look and theme of the word Canova went home once more and began work on the sculpture. He envisioned a depiction of Napoleon as Mars, envisioning a most colossal and breathtaking statue that would no doubt stop its audience in their tracks. Accordingly, Canova toiled at the sculpture and those who saw it during the period of its creation were suitably impressed and arranged for it to occupy pride of place in the Musée Napoléon. With the fate of the statue agreed, in 1806 the finished article took up residence in its new home and there it remained. With a somewhat full schedule, Napoleon himself did not actually make a visit to view the sculpture until 1811 and when he did, he was far from pleased with what he saw. Regarding the muscular physique and classical pose, complete with orb and staff, Napoleon declared that it was "too athletic". It was removed from public view and placed behind a concealing screen in the Salle des Hommes Illustres, where it remained for half a decade. The sculpture was set to travel on though and, when the Musée Napoléon was once again named the Louvre, the British government came calling. 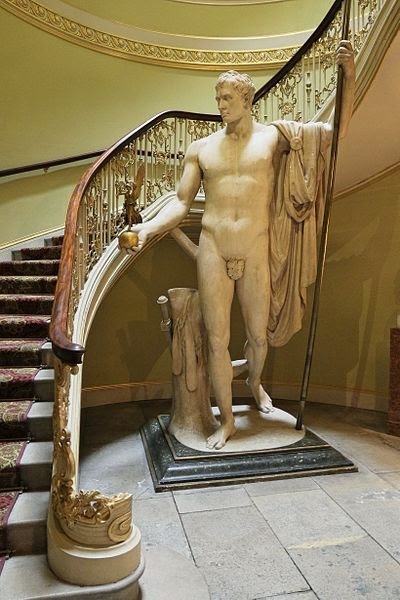 In 1816, a purchase price of £3000 was agreed despite Canova's wish to buy the sculpture for his private collection, and Napoleon as Mars the Peacemaker crossed the sea and found a new home in England. 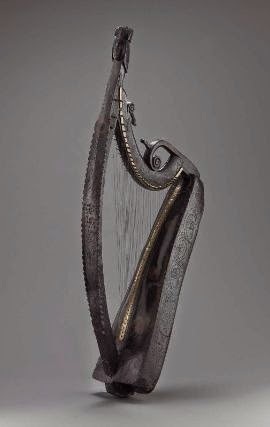 Here it was presented by the Prince Regent to the Duke of Wellington, a keen collector of Canova's work. Work was carried out at Aspley House to reinforce the floor and then, finally, Napoleon was installed in London, where he remains to this day.